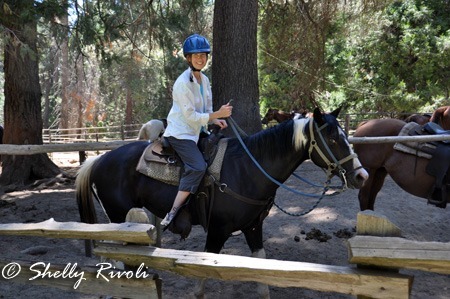 As part of our recent stay at Tenaya Lodge in Yosemite’s south, we were invited to hit the trails on horseback with Yosemite Trails Saddle & Sleigh Company, located just a one-mile walk (or drive) down a peaceful road behind the resort. Yosemite Trails is owned and operated by the Knapp family, which has been leading guests from around the world through Yosemite National Park for three generations, and you will see the family “K” branded on each of their quarter and painted horses setting out on trails around Yosemite National Park. On my beautiful “paint,” ready for the ride. 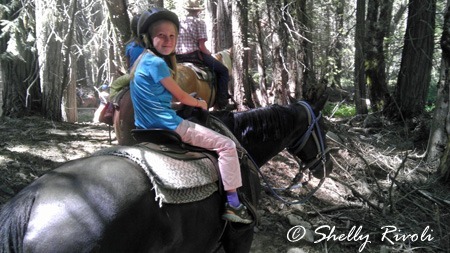 Since the horseback riding is limited to children 7 years and older (and over 46 inches tall), it was the perfect opportunity to have a very special Mommy-Daughter outing with just my girls, ages 7 and 9, while “the boys” did their own things back at Tenaya Lodge. My girls could not get to bed the night before, from excitement for their ride. My youngest daughter (shown in lead photo), who shared the saddle with me on our last official trail ride together in Costa Rica, kept asking if she would really have her own horse this time?! I told her I imagined so. For the youngest and inexperienced riders, the 1-hour ride is recommended, though Yosemite Trails also offers a Vista Pass 2-hour trail ride with great views and 4 river crossings, and a Giant Sequoia ½ day ride they describe as a visit to the 2000-year-old trees “John Muir style”—that is, on the back of a good horse. 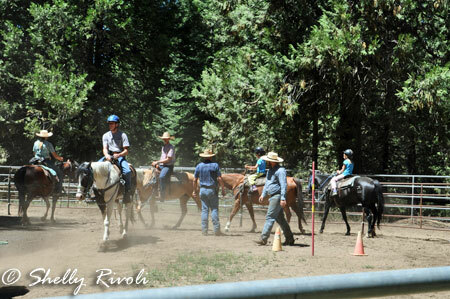 Practicing “steering” and stopping our horses in the corral before our ride. You should know up front, however, that you’re getting more than a 1-hour trail ride when you book this shortest offering from Yosemite Trails. Unlike many group rides, this is one complete hour on the trail. Don’t be surprised (says the voice of recent experience): Whatever the time stated on your tickets, know that you must be there half an hour earlier to get helmeted, matched with your horse, and then get training AND practice time on your horse in the corral before the riding segment begins at the stated time. As someone who has done many group trail rides over the years, I know it is all too often the case that you arrive, get matched to a horse, and off you all go down a trail, hoping for the best. I was impressed by the instruction and thoughtfulness Yosemite Trails put into its pre-ride prep for all of us, and I have to say that after making the rounds practicing steering and stopping our horses, leading them around the outside of the coral and weaving around a series of cones, I felt a lot better about heading into the wilderness with my daughters on their own horses. My big girl, ready for her first stream crossing on horseback. Backpacks and video cameras are not allowed on rides. A small camera with a wrist strap works well for the necessary one-handed shots. Wear long pants (thin if hot weather), to help keep the same flies that like the horses off of you (the ones in Yosemite occasionally bite). If you (and your kids) don’t have heeled boots, wear sturdy close-toed shoes. The stirrups here have a covered toe, which also helps with safety. Don’t bring water bottles or anything extra to lug along on the ride – you won’t have a place to put it. If coming from Tenaya Lodge, be sure to plan time for the 1-mile walk, especially if you’re going with kids who dawdle. Or else simply drive down the road. Don’t miss your photo op, cowboy! How to reserve your ride: If you will be staying at Tenaya Lodge, the hotel can book your rides for you, and you may be able to work it in as part of a special package with your stay or other activities, depending on current offerings. Check online at www.tenayalodge.com or call 1-888-541-2167. Other travelers can book directly with Yosemite Trails Saddle & Sleigh Company at www.YosemiteTrails.com or call 1-559-683-7611. You’ll find them at 7910 Jackson/Big Sandy Rd, Fish Camp, CA 93623. PS Did someone say SNOW? If you have the good fortune to come to Tenaya Lodge in winter time, Yosemite Trails is the business behind the horse-drawn sleigh rides you may also enjoy during your stay (kids under 3 are welcome on the sleigh rides and ride for free). Thanks so much to Tenaya Lodge and Yosemite Trails Saddle & Sleigh Company for providing this opportunity. 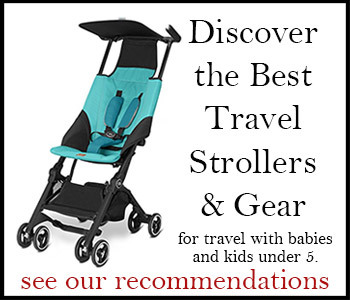 If you’re planning a Yosemite vacation for your family, keep following the blog for more posts, and check out my Yosemite with Kids board on Pinterest for even more ideas and tips for your visit. 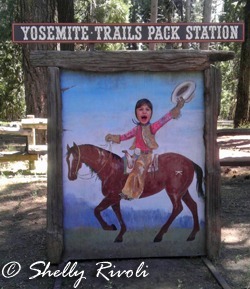 Follow Shelly Rivoli’s board Yosemite National Park on Pinterest. This looks like a great place to go horseback riding.